While women dream of diamonds, men strive for gold. A statement of luxury and class, this precious metal is, therefore, the ideal feature for any man who desires an eye-catching watch. When paired with black features, the resulting timepiece is highly luxurious, masculine, and timeless. To help you choose the perfect timepiece, we have put together a list of the best black and gold watches that every man should own. 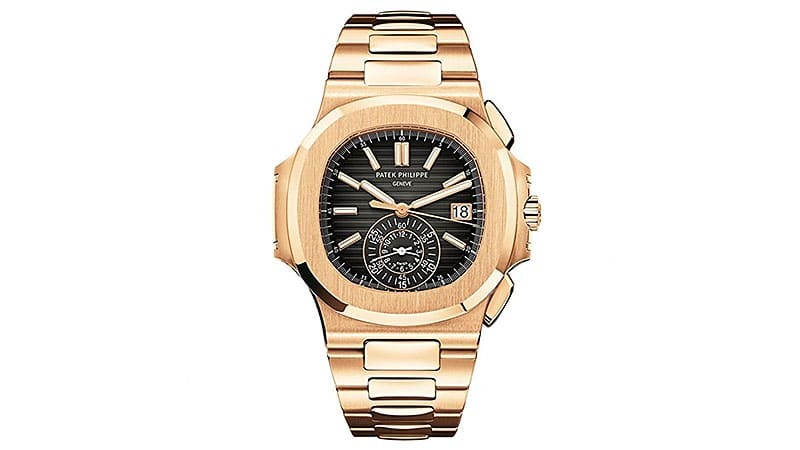 For a watch that would not look out of place in an overflowing treasure chest, it is impossible to go past Patek Philippe’s Nautilus Rose Gold timepiece. Guaranteed to capture the attention of onlookers, this high-voltage watch shines with an 18k rose gold case, band, and hour markers. A black gradient dial adds further refinement to this masculine design. A sapphire crystal case back ensures this watch is water resistant to 120, making it the perfect luxury piece for work and play. Additional features include a Swiss self-winding automatic movement, chronograph, and anti-reflective sapphire dial window. 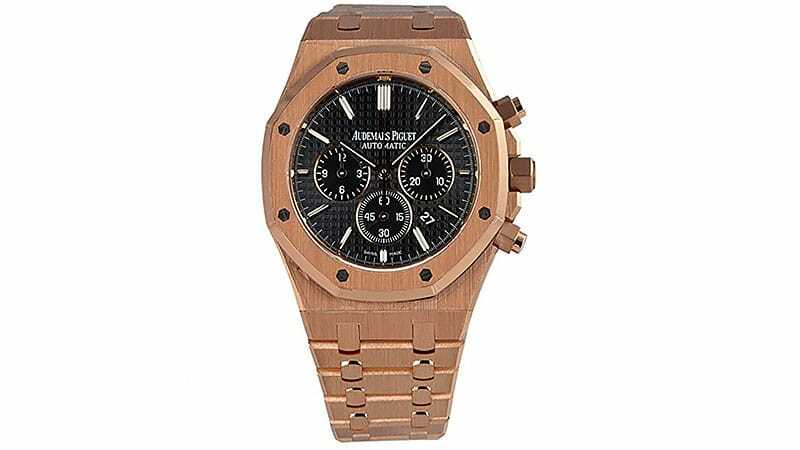 For men who are drawn to the forest and nature, yet still desire life’s luxury, Audemars Piguet Royal Oak Chronograph Rose Gold presents the ideal balance between the two. Created in celebration of the Royal Oak line’s 40th anniversary, the 18k rose gold bezel and bracelet gives the appearance of a refined oak piece. The rugged nature of this watch is further accentuated by its geometric bezel, which houses a statement black dial. From day to night, the office to the mountains, this self-winding watch is built for any lifestyle. It features an anti-reflective sapphire dial window, a chronograph and is water resistant to 50m. The name Rolex is synonymous with luxury men’s watches. Their latest instalment of the Yacht-Master 40 thus blends one of their classic designs with modern materials and updated features. Rolex’s exclusive, Everose 18k gold, features in the watch’s stylish case. 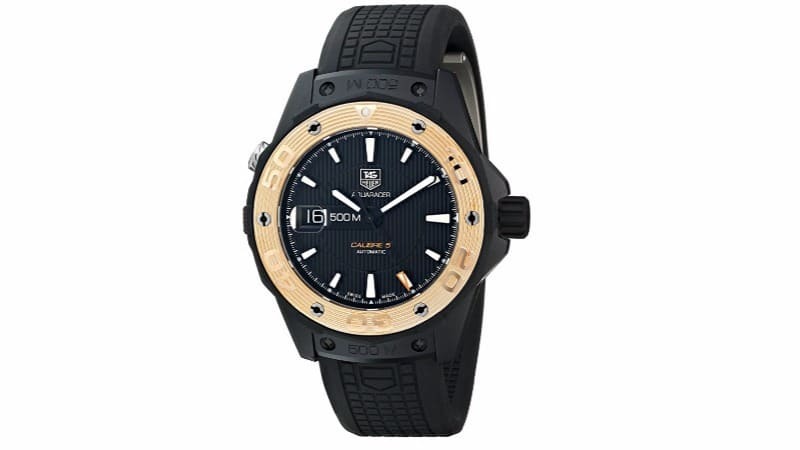 This is paired with a distinctive matte black dial, ceramic rotational 60-minute bezel, and Oysterflex rubber bracelet. This high-performance rubber is highly durable and presents a sporty, modern alternative to earlier metal models. With water resistance to 100m and a scratch resistant sapphire dial window, it is, therefore, suitable for any setting. Precision is the new essential characteristic for luxury watches, and accordingly, Rolex has made this their mission. As a result, the watch uses a perpetual, mechanical self-winding movement. It additionally features a Swiss chronometer that has the Swiss Official Chronometer Testing Insitute’s tick of approval. Slim and sporty, this rugged watch is the perfect partner for the avid sailor. With a quarter-second scale for measuring short stop times, an analogue display for longer times, and a flyback function, this chronographic watch is the ideal navigation instrument. It is also water resistant to 60m, with a scratch resistant dial window, making it essential for adventures at sea. 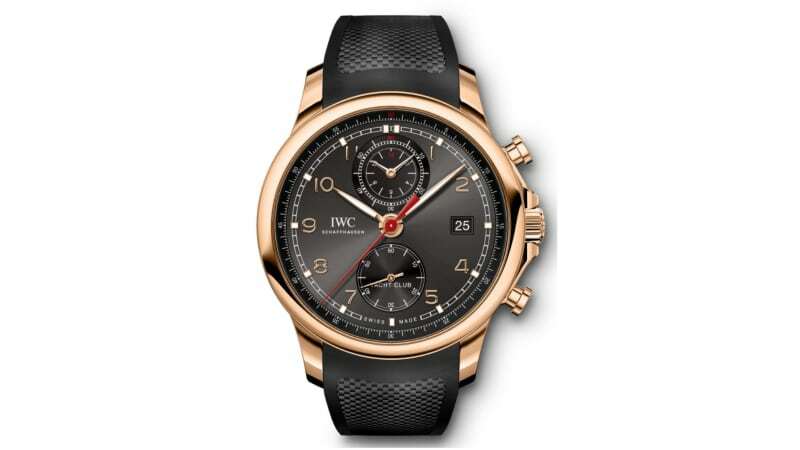 In addition to these functional features, IWC’s watch is a statement piece with an 18k red gold case and bezel. This contrasts against a slate coloured dial and a bold black rubber band. Leave the batteries at home when wearing this automatic self-winding watch. For the epitome of class and sophistication, look no further than Montblanc’s Star Black Guilloche Dial watch. Far from the mountainous snowy peaks that form the brand’s famous logo, this watch pairs black crocodile-patterned leather with 18k yellow gold. 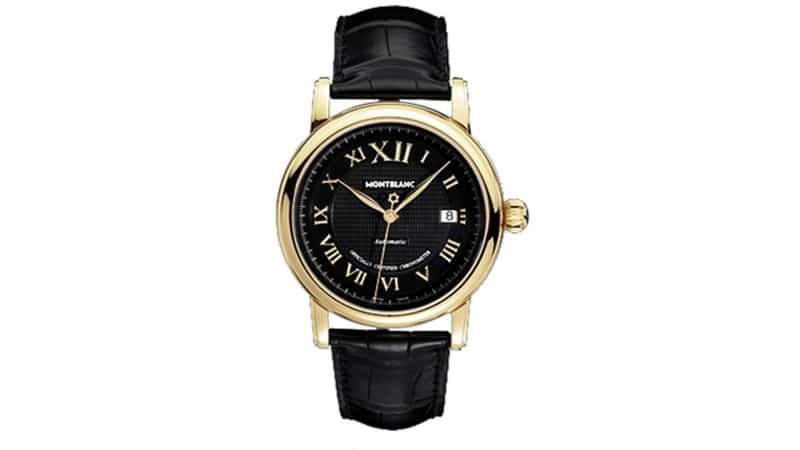 Matching its golden case and accentuating its timeless appeal, the black watch dial features 18k gold Roman numerals. The perfect accompaniment to a crisp suit, it harnesses a self-winding Swiss automatic movement. With a scratch-resistant sapphire crystal dial window and water resistance to 30m, it is recommended that this treasure is kept on dry land. Fit for a king, Hublot’s Classic Fusion Ceramic King watch features the brand’s famous natural rubber strap to ensure luxurious comfort. 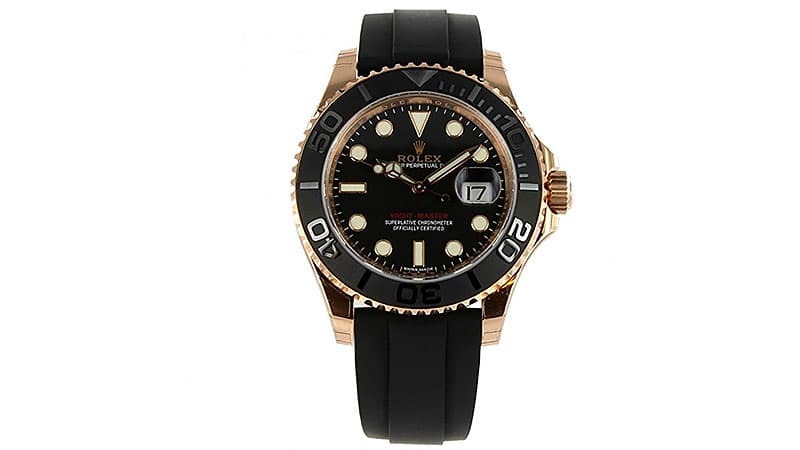 It is accompanied by a black ceramic case and 18k rose gold bezel, hands, and hour markers. As the official timekeeper of Ferrari, as well as the 2010 and 2014 FIFA World Cup, Hublot’s watches are renowned for their precision. Combining sophisticated design with accuracy and efficiency, the watch uses an automatic movement to measure the date, hour, minute, and second. Highly versatile and durable, it additionally features a scratch resistant sapphire crystal dial and is water resistant to 50m. For a final touch, the case back is transparent to allow watch lovers to admire the smooth mechanics within. Elegance, performance and tradition form the three core aspects of Swiss watchmaker Longines’ timepieces. The Conquest Classic Automatic is no exception to their consistent achievement of this trifecta of excellence. In this bold, masculine watch, an 18k solid gold case is accompanied by a matching bezel and hands. 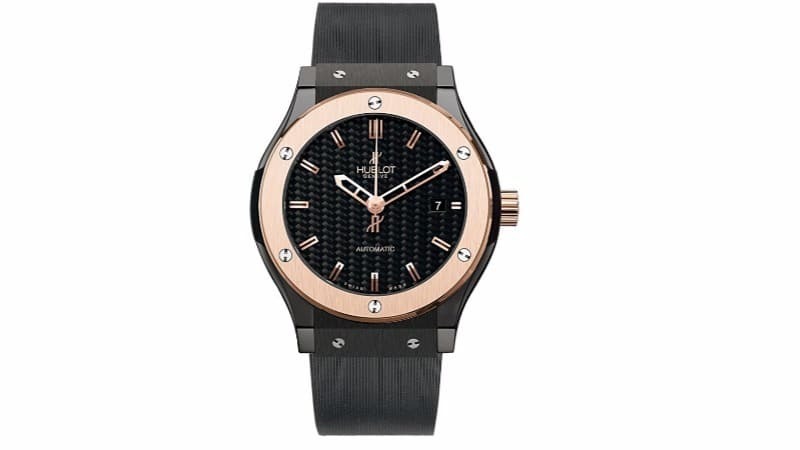 This coveted metal presents a luxurious contrast against its black dial and leather band. Combining function with a flawless design, it features a scratch resistant sapphire crystal dial, chronograph, date, and is water resistant to 50m. As a statement piece, this watch is ideal for formal occasions or men looking to add some luxury to their everyday style. Created by the pioneering luxury watchmakers at Cartier, the Santos 18k Gold Watch pays tribute to the brand’s rich history. 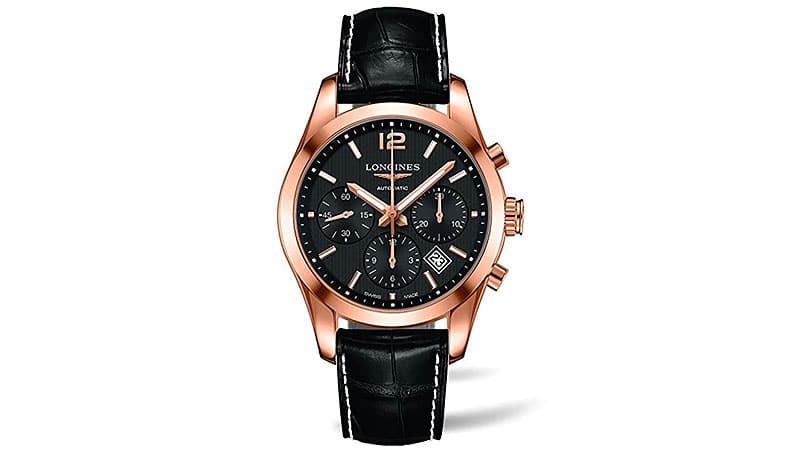 This sophisticated men’s timepiece combines an 18k rose gold and titanium case with a statement black leather band. Finer details include a contrasting black dial, as well as rose gold Roman numeral hour markers and luminous dagger shaped hands. Powered by a Swiss automatic movement, this collector’s piece is also highly durable. As a result, it features a scratch resistant sapphire dial window and is water resistant to 100m. 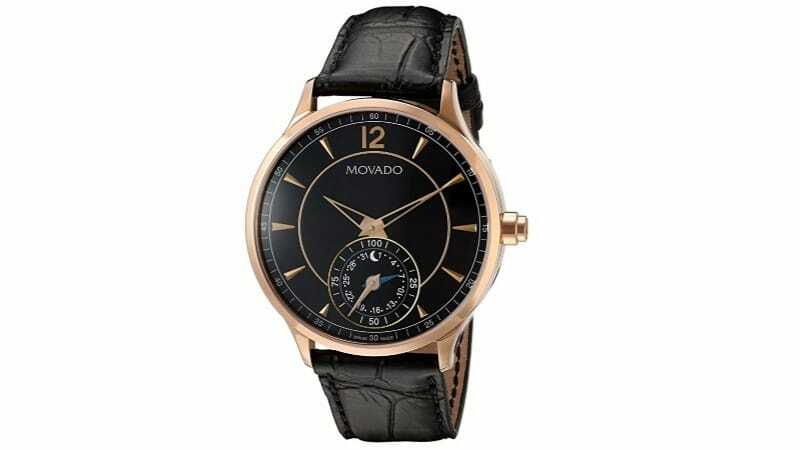 Movado is renowned for its excellence in design, technological innovation, and dedication to Swiss craftsmanship. With a brand name that translates to ‘always in motion’, their timepieces, similarly, strive towards the future. Pairing a rich black leather band with a rose gold bezel and case, this watch is elegantly smart, in more ways than one. A piece of wearable technology, this smart watch features Bluetooth connectivity, as well as a date indicator sub dial that tracks the wearer’s steps and sleep. True to its heritage, this Swiss watch uses a Swiss quartz movement. Deep sea divers seeking treasure below, or race track athletes striving for gold will discover their dream accessory in TAG Heuer’s sporty Aquaracer watch. 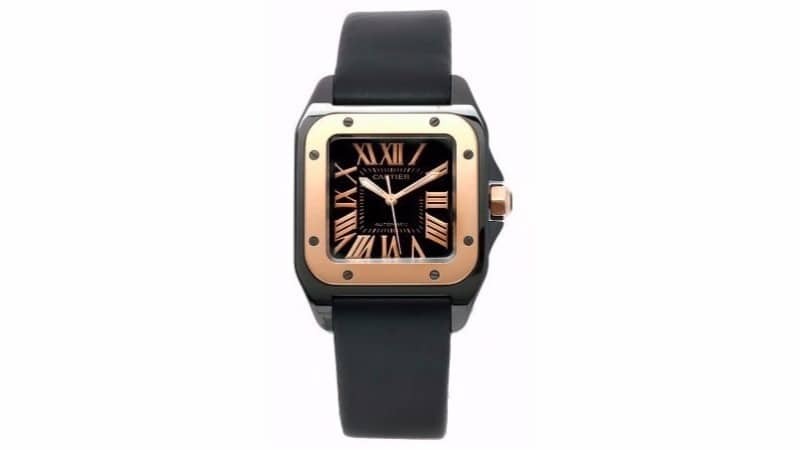 Sophistication meets durability with this piece, which features a rose gold bezel that shines against a black titanium carbon-coated case and a black rubber band. Additionally, destined for adventure, it is water resistant to 500m and has a scratch resistant sapphire dial. For men interested in the finer mechanics behind exceptional timepieces, a skeleton case back illuminates the inner workings to the wearer. Harnessing kinetic energy, this self-winding watch uses a calibre 5 Swiss automatic movement.